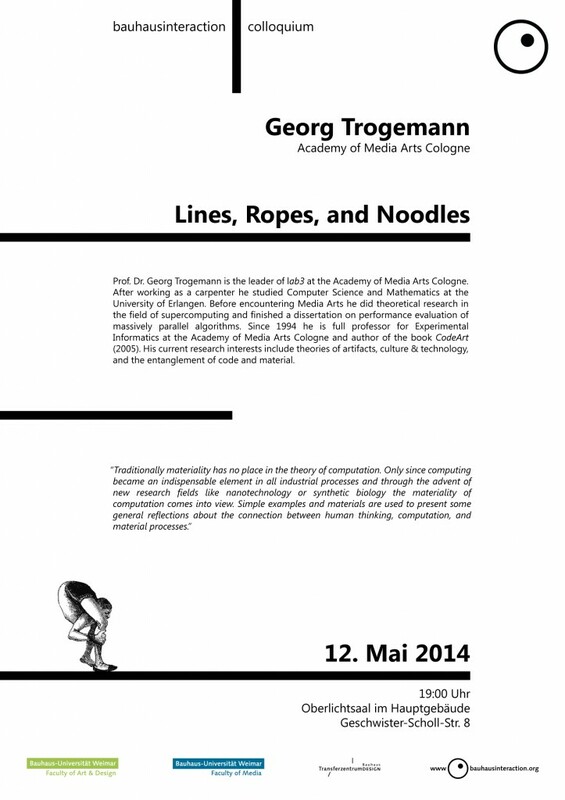 Prof. Dr. Georg Trogemann is the leader of lab3 at the Academy of Media Arts Cologne. After working as a carpenter he studied Computer Science and Mathematics at the University of Erlangen. Before encountering Media Arts he did theoretical research in the field of supercomputing and finished a dissertation on performance evaluation of massively parallel algorithms. Since 1994 he is full professor for Experimental Informatics at the Academy of Media Arts Cologne and author of the book CodeArt (2005). His current research interests include theories of artifacts, culture & technology, and the entanglement of code and material. This entry was posted in Bauhausinteraction Colloquium, info, talks by admin. Bookmark the permalink.